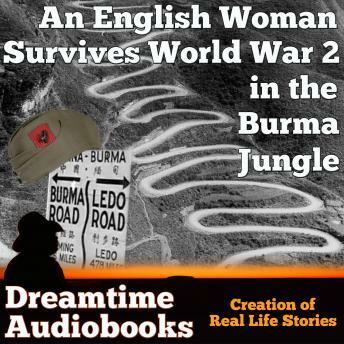 This is the true story of how an English woman joined the Wasbies (Womens Auxiliary Service Burma ) in World War 2 to deliver food supplies to the soldiers in the Burma jungle. We hear how she lived with her parents growing up in India and how her father was in charge of the shipping port in Bombay guiding ships in and out of the port. We hear how her brother's plane was shot down over Rangoon in Burma during WW2, and how she went back to Burma in her 80's to try and find his plane and grave. We hear about a memorial service in London for her Brother and other pilots who were shot down by the Japanese. She talks about how she became sick and was rushed to hospital, while on the plane she helped a Sikh who's jaw was blown off. This remarkable lady describes how she met her husband during the war and how he travelled to Bombay to marry her. We hear how she lived in the camps in the Burma jungle and how she saw soldiers die fighting the Japanese in the Burma jungle. The last chapter she states emotionally, "For your tomorrows we gave our today at a memorial stone in Burma"